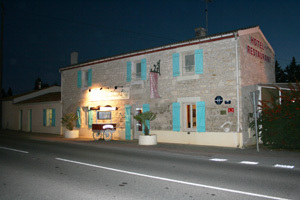 55,Route de La Roche-sur-Yon, Luçon Tel. 02 51 56 11 32. It had been a very hot August day, the sort of day where one doesn’t want to leave the pool and the ideal food is throwing a couple of things on the BBQ and grabbing a drink of something extra cold. 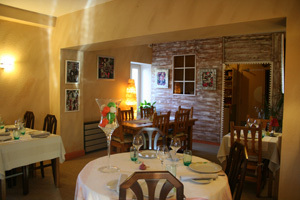 Trevor and I however had booked a table at Au Fil des Saisons, a restaurant with a sizeable reputation in Luçon. 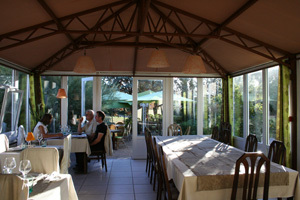 After a fairly lengthy drive we found the restaurant, it had a pleasant looking dining room, a veranda, which is a conservatory, overlooking the garden and courtyard and a terrace where one can dine al fresco under large umbrellas. We chose to eat in the veranda room, which was a mistake as the evening was warm and still and the veranda room was a little bit hot and stuffy, dinner on the terrace would almost certainly have been a cooler experience. The Menus arrived, there were menus at €18.50, €24.50, €31, €36 and €40 depending on the number of courses you wanted, we opted for the Menu Gourmet at €24.50 which afforded us an entree, a plat and a dessert. 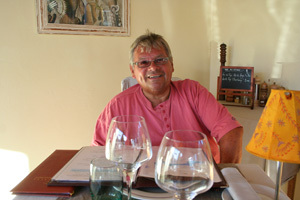 As there was no alcohol free beer, Trevor had a tonic, and I had a Kir Royal, which were accompanied by some “Mis en Bouche” consisting of a dish of creamy goat’s cheese with chives served with toasted bread and another dish of olives and carrots in a slightly seasoned oil. 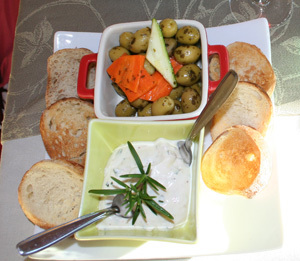 The goat’s cheese dip was excellent and the olives were also very tasty. There was no house wine so I was ordering by the glass, which was just as well as the wine was pretty expensive, with half bottles starting at €14. I ordered foie gras de canard as an entree it came with a slice of fresh foie gras and a smaller slice of sautéed foie gras, I would have expected slices of sautéed or poached fruit with the sautéed foie gras but alas there was none, it was cooked with juniper berries, which did give it a better flavour but this did not compliment the slice of cooked foi gras as a piece of sliced cooked pear or apple would have. 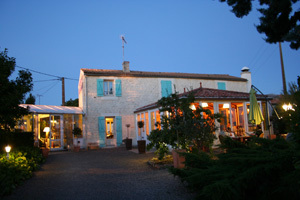 I had a glass of Coteau de Layon which was very good and although sweet was not too sweet and cloying. 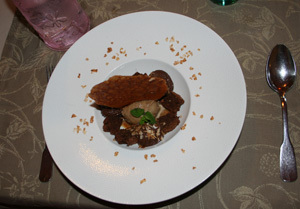 There was a downside to my starter, which I only realised when I studied the bill, there was a €4.50 supplement for the foie gras and the wine was €5.60 a glass, adding over €10 to the cost of the meal. 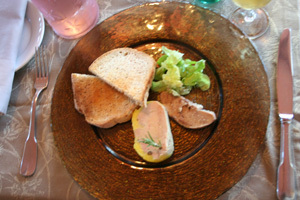 Foie gras de canard is definitely the poor relation to foie gras de l’oie, which is the real thing, I had had the real thing earlier in the week at a bistro, there had been no supplement and the whole meal had worked out at half the price. Trevor had a goats’ cheese pannacotta with tomatoes herring and potatoes, it was a good dish with a nice mixture of flavours. 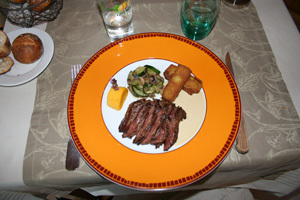 The main courses arrived, Trevor had ordered the “Butcher’s Choice”, which was an Onglet of beef, this is a cut that is appearing more frequently on menus, as a less expensive alternative to fillet, it was well cooked but in keeping with the rest of the meal there was not a copious amount of it. 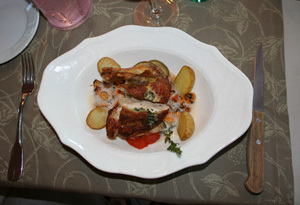 It was served with croquet potatoes, courgette and onion and a pumpkin puree. Trevor was happy with the taste and the way that it was cooked but he did think it was less than copious. My guinea fowl was well cooked it was a leg and breast, and was served with a sauce of mussels in tarragon, and Espelette pepper. It was moist and the sauce was good although I didn’t think that the guinea fowl was as tasty as I would have expected, it was served with a few sautéed potatoes. 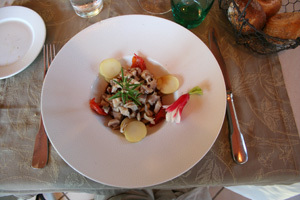 All in all it was like so much of the meal, it promised much but lacked in both quantity and delivery, falling short of the excellent standard that one might expect from a meal in a restaurant of this purported quality. I had a glass of vin de pays rouge the name of which escapes me, it was alright but expensive for what it was at €4.50 per glass. Dessert arrived I had chosen Theo’s Chocolate delight, it was essentially a deconstructed chocolate fondant, with a ball of chocolate ice cream at its centre, it was chocolate and maybe Theo was the chef but it was mediocre and certainly not worthy of the term delight. 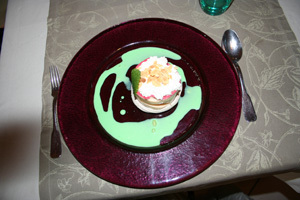 Trevor had a meringue topped with a strawberry and melon sorbet with Chantilly cream and toasted almonds on a pistachio sauce, it was a good dessert although Trevor did comment that although he enjoyed the meringue he didn’t think that it was cooked as a meringue should be cooked. We finished the meal with large white coffees they were served with 4 piped meringues which were perfectly cooked.